Ghewar Ram and Gauri Devi, who live in the hostile desert of western Rajasthan, own just a one and a half bigha plot of land. They used to migrate in search of livelihood every time a drought struck. Not any more. With the help of Unnati, a Non Governmental Organisation, they have adopted horti-pasture techniques. The family first planted local species such as ber, goonda, karonda and lemon, created a rain water harvesting tank and a boundary for the farm to prevent stray animals from destroying the crop. Next year, Gauri Devi introduced guvar on her farm as a part of inter cropping. By the end of the second year, the farm turned profitable. While her family has to put about two extra hours of work on the farm, inter-cropping has benefited them immensely in terms of fodder, fruits, vegetables and other produce. The family has been able Collective hope bears fruits in arid Rajasthan to earn Rs. 20,000 by selling nearly 300 kilograms of ber. Ghewar Ram is jubilant when he says that the income from the plot has increased ten times. The pain and suffering of this drought-prone region is a part of its folklore. ‘Saatkaal, sattaisjamana, trisathkuriakacha; teen kaal, aisapadela, maapoot mile napacha’, goes a local saying. It means that out of every 100 years, only 27 years are good. There are seven years of drought, 63 years of severe drought and three years of so much distress that a mother and her children get separated. Traditional survival strategy revolves around effective water management, animal husbandry, mixed agriculture and collective will. 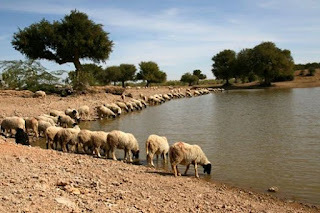 ‘Das hove chaukhibakriyaan, eksaantaron oont, das hove khejdala, to kaalkaad doo koot’ – A family can survive a drought if it has ten goats, a camel and ten khejdi trees. (Khejdi is a multipurpose legume with its parts used as food, fodder for the livestock, and raw material for constructing houses). There is a growing evidence that climate change has led to an increase in the frequency and intensity of climate-related hazards. There has been an increase in the incidences of drought post-1961. The highly erodible desert soil is deficient in nutrients, and has a high infiltration rate and a low moisture holding capacity. The Thar desert region receives an average annual rainfall between 100 and 300 mm. Agriculture is the primary occupation of 82 per cent of the population. Almost 80 per cent of agriculture is rain-fed. This means that small and marginal farmers, who constitute about 78 per cent of the farming community, depend on rain for irrigation and thus, are the most vulnerable population segment. One of the primary source of livelihood for these farmers is livestock and they traditionally relied on common community land and resources to maintain them. However, the Common Property Resources (CPRs), particularly the oran and gauchar (community grazing land) and nadi (village pond) which used to be managed by the community have been declining as bigger farmers move towards mechanization of agriculture coupled with individualized water supply. This means growing food and fodder insecurity, poverty and migration for the marginalized population. While reviving these CPRs is of utmost importance for building resilience against drought, Unnati has been helping small and marginal farmers in western Rajasthan in developing horti-pasture plots and rain water harvesting tanks. It is also helping them in providing veterinary care to reduce animal morbidity and mortality, as well as prevention of malaria. There was a strong belief that horticulture cannot be promoted in the desert ecology. However, with examples such as Ghewar Ram and Gauri Devi, villagers are now willing to try it out. The credit goes to experiments and trainings done by Central Arid Zone Research Institute (CAZRI) and other Kisan Vikas Kendras. They have provided expertise and training to the farmers on a continuous basis. They also provide an interface to the plot owners so that they can easily seek advice on plant varieties and combinations. Over the years, many volunteers have developed specialized skills and have started functioning as local resource persons extending voluntary support to farmers as well as local government functionaries on various aspects of horti-pasture system, grafting and choice of seeds. This has helped the disadvantaged farmers, especially women, in the initial years of switching to farming and livestock rearing techniques that make them resilient to droughts. Horti-pasture starts giving dividends from the first year itself as is evident from the table given below. Plantation and fencing increases soil fertility providing better yield from inter-cropping. It has led to the regeneration of 21 local grass and shrub varieties that are used as fodder for the livestock. Some are also used as vegetables by people. They also contribute to soil nutrients and prevent soil erosion. 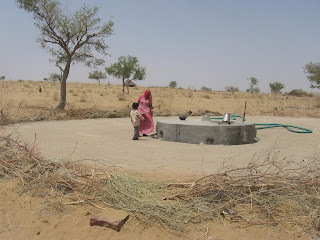 Making rain water harvesting structures, horti-pasture plots, specialized animal care, fodder banks and malaria prevention and cure accessible to small and marginalized farmers has proved to be of great use in building resilience to drought in desert areas of Rajasthan. It improves the adaptation capacity of small and marginal farmers by improving their fodder and livelihood security. Many village and block level functionaries of the Mahatma Gandhi National Rural Employment Guarantee Scheme (MGNREGS) now want to include horti-pasture plot development in their annual plans. Green fencing and construction of water harvesting tanks have been approved under the MGNREGS in Rajasthan. This has helped hortipasture system gain wider acceptance across the State with more and more small farmers switching to this form of agriculture. Disclaimer: Views and/or opinions expressed in this article are those of the author(s) and do not necessarily reflect the official policy or position of NDMA.